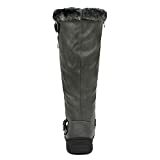 This tall boot is lined with a faux shearling that is soft against the skin and traps heat to keep you warm and comfortable! 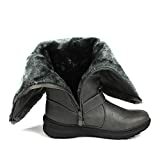 Featuring faux fur lining, faux suede upper, round toe, flat heel, stitching detail, padded collar, and finished with lightly cushioned insole for the best comfort. FITTING TIPS: Customers with wide foot or thick socks, please order half size bigger. 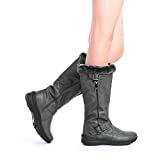 Interested in the DREAM PAIRS Rabbit Women's Lady Winter Fully Fur Lined Double Buckle Ruched Snow Knee High Boots Grey PU-SZ-9? Is the price too high? You can easily price watch this product and we'll notify you when the price reaches your target.